I love this image of Jennifer getting ready. The entire wedding party got ready at the Tonawanda Castle in Tonawada, NY. They also had their ceremony and reception there. The Castle is so beautiful for photos, they also wanted to stay there for the idle. The room on the third floor is the best for the bride and her bridesmaids to get ready in. There are huge windows and the light always pours in. Even on a gloomy day. Jennifer wanted all of her ladies to help her into her dress! After clearing out some furniture, there was enough room for everyone to help! Normally we have the bride get covered in her dress before going in for photos. We like to take pictures of the details and tying or zipping up the dress. We want to make sure the bride is comfortable and confident before we come in. Jennifer did not care. She was already covered with all of her undergarments and said not to leave. This was great. We never get to take images like this. All the girls helped with a part of the dress. They were easing the dress over Jennifer so her hair did not mess up. All of the girls look so serious like they are on a mission. They did a great job! It was a success! I love how you can kind of see Jennifer's face through the sheer material of her dress. She was not completely hidden. And I like how you can see all the girls hands and arms holding up the dress! 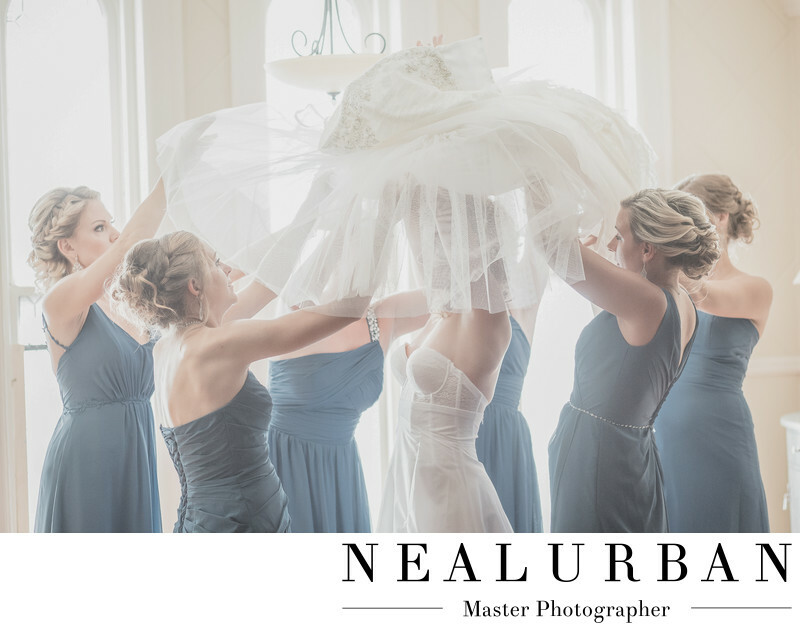 I did not have the pleasure of working with Neal for this wedding. I had my own wedding out of town that weekend! I still did the basic editing for this wedding and was so excited to see the images! Neal and his assistant did an amazing job! They got beautiful images of Jennifer and Anthony! Location: 69 Delaware St. Tonawanda NY 14150 United States.